In case you forgot, I watch a whole lot of TV. Typically I TiVo (yes, it’s a noun and a verb) shows and fast forward through commercials. TiVo is sort of a spiritual experience for me; I wouldn’t say I worship it but I do respect it as a Higher Power of sorts. Still, on occasion I do end up watching live TV which means I see a bunch of commercials. Two questionable commercials caught my attention recently. Granted, I’m a vegetarian, but I think these are bad either way. Let’s start with KFC boneless chicken. 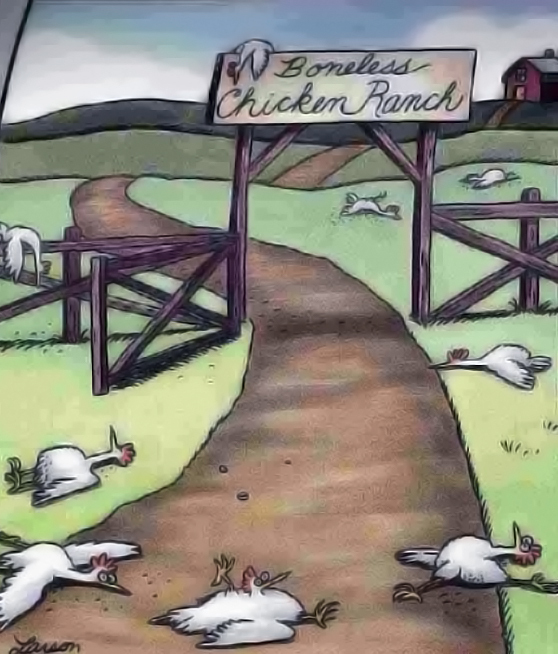 KFC just awoke from a long slumber and discovered that lots of people want boneless chickens. They seem to be a little out of touch…who’s going to break the news to them about the Interwebnet? These execs clearly haven’t seen a chicken lately or they would have caught on. Anyway, the commercials show someone eating an entire plate of chicken and then someone else screams “you ate the bones!” The platter is indeed devoid of bones, so the chicken-eater starts freaking out that he ate all the bones. Eating bones is disgusting. Didn’t Mama Cass die from choking on a chicken bone? Maybe that’s just an urban myth, but my mind still goes straight to a dead Mama Cass. It’s not pleasant. 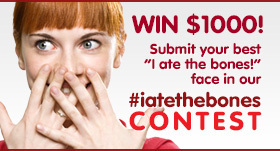 KFC is even having a contest for who makes the funniest face after thinking they ate the bones. Mine would be green with someone nice holding my hair back for me. Vegetarian or not, I find it hard to believe this is appetizing to anyone. If anyone out there desires a bucket of chicken after all that, please weigh in so we can fairly represent both sides of the story and show why my opinion is right. Noteworthy for completely different reasons is Famous Dave’s BBQ. 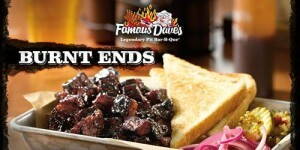 They have hit the summer market hard with a new offering called, get this, Burnt Ends. I couldn’t even make this up. When I think of burnt BBQ only one thing comes into my head: carcinogenic. Do you know what I would give to have been a fly on the wall when the ad agency and marketing execs came up with this one? Yeah, these are the burnt ends we used to throw away, but now we’re offering them to you as a premium dinner for $8.95 with two of our Sloppy Seconds side dishes. According to Famous Dave, these are the “burnt, crispy ends that pitmasters usually keep for themselves.” I vacillate between being astounded by the gall it takes to do this and being incredibly impressed with the marketing prowess. I can only assume that the Fat and Gristle Platter is coming up next. And what is KFC doing with all the unused chicken bones? Throw those on the platter too. Everybody working up an appetite? This entry was posted in Uncategorized and tagged Animals, Business, Culture, Humor, Television. Bookmark the permalink. You gotta love marketers. They have a way of putting a spin on anything to make money. I remember when chicken wings were things that the butcher didn’t know what to do with so he sold them in big packs for a $1. Creativity! I am not a vegan but neither am I much of a meat eater either. I don’t eat chicken wings and you can bet I won’t eat either of these fabulous offerings either!